Ben Connan - blackcurrant bush £5.00 - Soft Fruit - Blackcurrants Apple Trees and Fruit Trees For Sale. Buy at competitive prices with wholesale discounts. 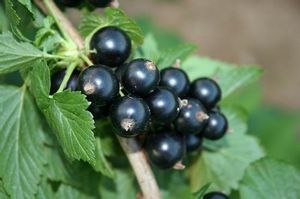 Generally blackcurrants are high in anti-oxidants and easy to grow. Allow two years to come into full cropping.A modern Scottish variety bearing heavy crops of very late ripening currants. Rich tart flavour,makes a good syrup, delicious as purée with yoghurt or ice cream, or use in pies, jams or juices, freezes well. A rich source of vitamin C.